Pepper's Paws: Nutro Natural Choice Dog Biscuits - Product Review and Giveaway! Nutro Natural Choice Dog Biscuits - Product Review and Giveaway! This time the box in my mail was for me! It was full of pawsome Natural Choice dog biscuits from my pals at Nutro! We get to eat these after you take the picture, right? They sent me 4 packages of different biscuits to try! Yummy!! They even came with a Nutro totebag! Baron was visiting me when they arrived, so I had to share with him. Who says diet food is bland? This biscuit is delicious! Mom allowed us to eat the Lite ones first. I gobbled mine up right away! Nutro Lite biscuits are low fat and low calorie. They contain healthy fiber and whole grains. Yummy chicken and brown rice! Next, we were given Grain Free. Pawsome Lamb and Potato! Yummm!! Nutro Grain-free biscuits have limited ingredients and zero grain to minimize digestive issues and food sensitivity reactions. I have to eat it before Pepper tries to take it! I think this may be Baron's favorite, he ate it almost as fast as I did! Gotta lick up all the yummy crumbs! Baron and I give Nutro Grain-Free Lamb and Potato biscuits 8 paws up! I have a yummy Tartar Control biscuit! The texture of Tartar Control Biscuits is designed to scrape away plaque and Tartar. It contains decaffeinated Green Tea extract to freshen breath. Hey, wait a minute! Are you saying I have DOG breath! Say what you want, as long as I get to eat the biscuit! BOL! The Tartar Control biscuit is delicious chicken and brown rice! Baron crunched his into tiny bites. I gobbled mine in one mouthful (too fast for the camera). I never said I was a dainty eater! BOL! Of course we love the Small Breed ones, they are just the right size! Delicious chicken and brown rice, formulated to tempt even finicky small dogs like Baron. 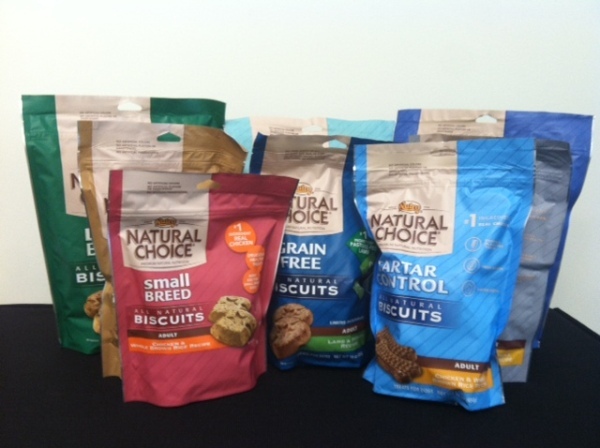 All Nutro Natural Choice Biscuits are made in the USA from all natural ingredients. Nutro is providing 8 bags (one of each variety) of Natural Choice Biscuits to share with my pals! 3 lucky readers can win Nutro biscuits! I have 8 bags to giveaway, one of each variety. Please leave a comment listing the ones you'd like to try if you win, in order of preference. I'll try to divide them up so that each winner has at least one of their top 3 varieties in their box. Afternote: There were 191 total entries. After the winners were drawn, the other entries were cleared. Us doggies could use the Tartar Control or the lite. It would be great to win! Mommy's hoping the Large Breed ones would keep us occupied longer! We don't see a flavor we wouldn't love! I only have one bag of Small Breed Biscuits to give. The Tartar Control and Grain-Free only come in the one size-average. Will that be acceptable if you win? Oh! No!! I don't understand why it would do that. I hope it lets you enter later, once they fix their glitch. I just checked and it had you in there! Maybe it was delayed. I hope it keeps working. Yummy! And they must be good if a picky dog like Baron loves them! Thank you for these pawsome contests, Pepper! They all sound so yummy! My dogs would love all of these treats. Yes! You did it right!!! Yaaay!!! There were 191 total entries.